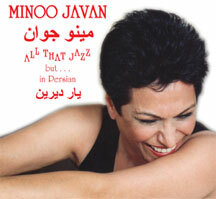 On the All That Jazz album Minoo Javan sings soulful American Jazz classics in the soft and romantic Persian language. It was produced by the incomparable Les McCann, an American Jazz icon, who also appears as a guest artist on this recording. “Les McCann built a career on partnerships and an unwavering trust in the creative process. His output has been eclectic, composed of both recordings as a leader and musical affiliations with other singular artists, but his body of work has a commonality to it; a trust in the spontaneity of inspiration and the gestalt that arises when great players push each other to new creative heights. “ Written by Joel Dorn on Relationships: The Les McCann Anthology (Atlantic 1993). All That Jazz but . . . in Persian (YARE DIRIN), is a project that has been on my mind for many years, since American Jazz has penetrated my soul in much the same way that Persian music has been embedded in my archetype. After singing countless Persian folk songs and other forms of Persian music, followed by learning and performing Western Classical music and subsequently performing the music of Broadway and Cabaret on various stages in different parts of the world, I found myself still fascinated with an old hunger to somehow interpret the richly textured American Jazz idiom through a Persian lens.